It’s a snow day. Finally, you get a break from your third grade class. You just woke up, and you’re faced in front of a TV. You flip through the channels and arrive at your channel. Well, which one is it? Disney or Nickelodeon? Everyone knows the tension between old Disney lovers versus the old Nickelodeon lovers. Of course, there were people who adored a classic Cartoon Network, and even people who were “dangerous” and watched MTV. I’ve always been torn between Nick or Disney. When Disney Channel went on commercial, I would immediately go to Nick. We could always focus on how some Disney stars literally go CRAZY, don’t let me talk about the time Miley Cyrus came out with wrecking ball. 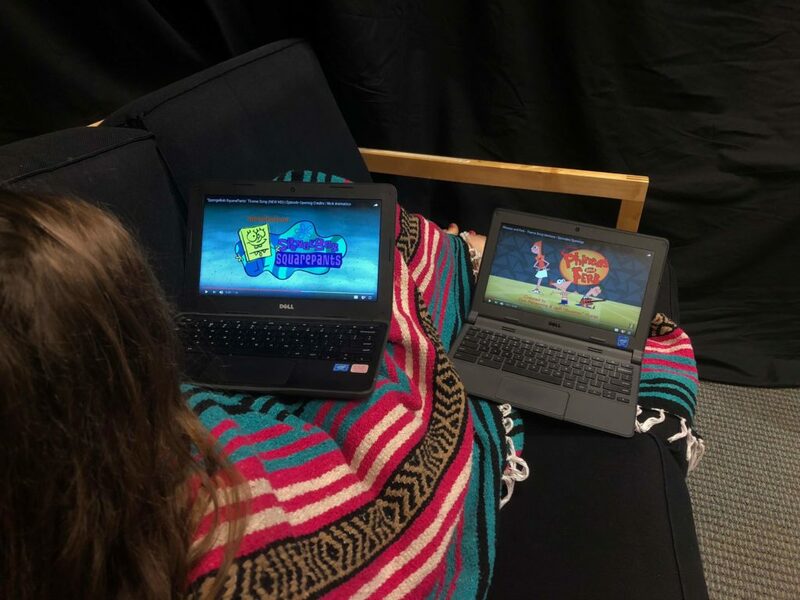 No matter what someone used to watch, there will always be someone who chooses to watch the classic Zoey 101, and others who prefer Wizards of Waverly Place. One of the most important aspects of a Disney or Nick show is it’s theme songs. According to Grace Parker, Disney always had the better theme songs. Personally, I always loved the theme song for Hannah Montana and Wizards of Waverly Place. But, don’t let me forget about the iCarly or Victorious theme song. I say the theme song issue is debatable. Another perk of Disney, according to Kelsi McCarthy, is the channel placement. “Disney always came before Nick on the guide list,” McCarthy explains. If you start at the top of the guidelist and move down, Disney does appear first. For some, seeing the Suite Life of Zack and Cody on their screen was all they needed. They didn’t need to see what was on for Nickelodeon. And yet another perk of Disney, according to Matthew Iannone, is that it wasn’t inappropriate. Nickelodeon sometimes does allude to inappropriate things, and as a kid Iannone didn’t understand. Imagine not being able to watch Spongebob. That’s unfortunate. At least he was able to watch Suite Life of Zack and Cody, his favorite Disney show. Not many people preferred Nick over Disney. It wasn’t very popular, and there’s a belief that Nick had less quality television shows. Which program had more shows that were popular? Nickelodeon did have a few good shows, while Disney was more abundant. Nickelodeon had Big Time Rush, Drake and Josh, Zoey 101, iCarly, Spongebob Squarepants and a few others. This is a fair amount from Nickelodeon, plus it depends on your own personal opinion. Perhaps you even liked Ned’s Declassified School Survival Guide or House of Anubis. Disney has a lot, to say the least. Sonny with a Chance, Suite Life of Zack and Cody, Phineas and Ferb, Wizards of Waverly Place, Hannah Montana, Kim Possible, That’s so Raven, and even Lizzie McGuire. The list goes on for both programs. Ask yourself: Which program, in your opinion, had more shows that were popular? If you chose Disney, add one point for Disney. If you chose Nick, one point for Nick. Which show is better: Drake and Josh or Suite Life of Zack and Cody? Drake and Josh are the complete opposite, different personalities, different friends, but the same house, same room. Zack and Cody live in the Tipton Hotel and turn the hotel into their own house. They too, are different. Cody tends to act smarter, while Zack is more immature. Two sets of brothers, one set of twins and one set of step brothers. What do you choose? One point for Disney if you choose Zack and Cody, one point for Nick if you choose Drake and Josh. Which cartoon do you prefer: Phineas and Ferb or Spongebob Squarepants? The shows are quite different. Phineas and Ferb do crazy things behind their sister Candace’s back, including building walking tree houses. Spongebob Squarepants lives in a pineapple under the sea, and the show is about his life at the Krusty Krab. He has a starfish best friend, a pet snail, and a crab as a boss. Of course, the cartoons are different. Picture yourself as a kid scrolling through the channels, do you choose Phineas and Ferb or Spongebob Squarepants? One point for Disney if you chose Phineas and Ferb, one point for Nick if you choose Spongebob Squarepants. How many points do you have for Disney? Nick? Whichever one you have more points for you most likely do prefer. However, it really is up to you and whichever one you always used to (or still do) flip to first.